I am really not much of a drinker, but it's nice to have a nice shaker set in case you have friends or family over for a get together that do enjoy a drink or 2. 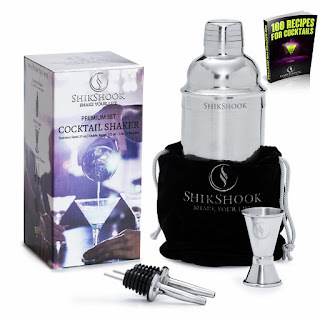 I received the Cocktail Shaker Premium Set by SHIKSHOOK. This is a very nice stainless steel set, which makes it very durable and easy to clean. I have tried it out with fruit juices to see how it works and there are no leaks. The double jigger that comes with it measures accurately. One side is 1/2 oz, and the other measures 1 oz. There are 2 liquor pourers also included and a nice velvet carrying bag. For those who want to try out new drinks there's a 100 cocktail recipe ebook too. This is good for holiday parties, family dinners or even makes a nice gift. I also received a Wallet Case for iPhone 6/6S, I ordered the Turquoise /White, but it comes in an array of colors. 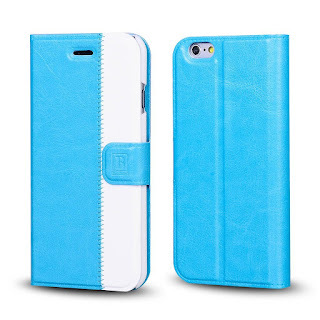 It's very attractive and up to date looking.I really like that it has a very slim line, it's not big and bulky like a lot of the wallet cases are.It offers good protection for you phone against being dropped or scuffed. My phone was very easy to install and you can use your camera with the case on. Plus what I think is pretty cool, this case converts to a stand so you can watch videos. There are 2 compartments so you can carry your money, identification, or cards. Now I don't really need to carry my big purse everywhere, I can keep what I need in my case. This case is actually slim enough to slide right into my back pocket. These are both really good products and I recommend them, just don't use them together. No drink texting haha.